Citation: Martel, L. M. V. (October, 2017) Accretional Layers Preserved in a Meteorite, PSRD, http://www.psrd.hawaii.edu/Oct17/Isheyevo-accretion.html. --- Visible sequence of layers in the Isheyevo meteorite tells a story of impact debris deposited, layer by layer, onto the surface of the surviving planetesimal. Research focused on the Isheyevo meteorite is uncovering a story from the beginning of Solar System–of planetary accretion. 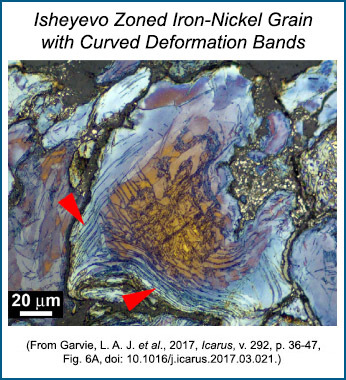 Laurence Garvie (Arizona State University), L. Paul Knauth (ASU), and Melissa Morris (State University of New York at Cortland) have been studying the visually appealing, millimeter- to centimeter-thick laminations in the Isheyevo carbonaceous chondrite. They use a sweep-up model to explain how a mixture of silicate and metallic particles in a plume of impact debris from a two-body glancing collision could be accumulated, layer by layer, onto the surface of the surviving planetesimal that spun downrange through the plume. PSRDpresents: Accretional Layers Preserved in a Meteorite -- Short Slide Summary (with accompanying notes). Isheyevo [Data link from the Meteoritical Database], found in Russia in 2003, is a carbonaceous chondrite meteorite. Chemically classified as a CH/CBb chondrite, it has a composition between the high-metal group (CH) and the Bencubbin-like group of high metal, small chondrules, and impact melt (CBb). 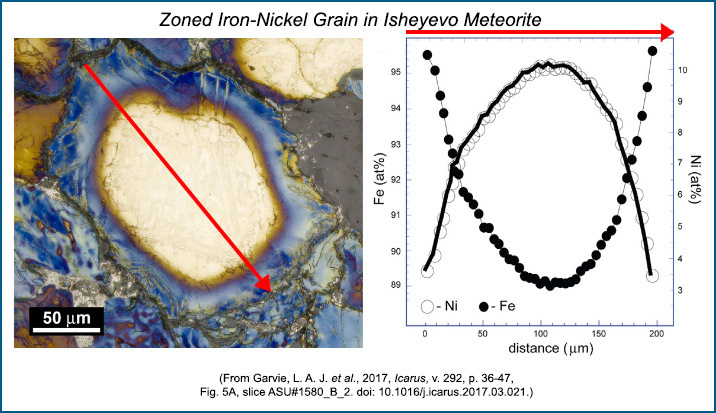 Within Isheyevo, iron-nickel metal grains are mixed with chondrules, CAIs, and rock fragments some of which have phyllosilicates and organic matter. A striking feature of this meteorite, and a focus of work by Garvie and colleagues, is the sequence of fine layers similar in appearance to layers seen in terrestrial sedimentary rocks composed of compacted and cemented wind- or water-laid sediments. But let's set the record straight—Isheyevo is not a sedimentary rock in the Earth-science sense. Garvie and coauthors, as we'll see in a following section, interpret the sedimentary-like features in this extraterrestrial sample as evidence of formation in the vacuum of space by quiescent settling of solid material under low gravity onto a planetesimal, followed by burial and compaction. 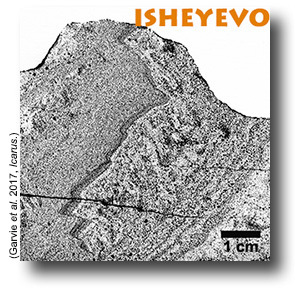 Before we review "how the layers formed," we will look at the sequence of layers so beautifully revealed in the Isheyevo meteorite. The laminations of silicate and metal-rich compositions are shown in this cut and polished slice of the Isheyevo carbonaceous chondrite. Metal appears bright and silicates appear grey to black. Garvie and coauthors identified seven units, labeled A through G. The yellow, dashed-line segments are meant to help guide your eye along the boundaries of the units, described in brief below. Unit A: Overall metal-rich; finely laminated. Unit B: Richer in silicate grains than unit A; finely laminated due to variations in metal to silicate ratio; grains are sorted by size with few larger than 100 µm. Unit C: Richer in silicate grains than unit A; finely laminated. Has a ~1-millimeter-thick metal-rich layer at the boundary with unit B. Unit D: Overall metal-rich; convoluted laminations defined by variations in metal to silicate ratio. Lobe-shaped margin bulges into unit E.
Unit E: Layer of coarse silicates and metal grains (500—1000 µm size) at the boundary with unit D; metal-rich at the boundary with unit F.
Unit F: Laminated due to variations in metal to silicate ratio; metal-rich at the boundary with unit G. Lobe-shaped margin bulges into unit G.
Different amounts of Fe-Ni metal versus silicates result in laminations with abrupt or gradational contacts in the Isheyevo meteorite, which Garvie and coauthors used to define their seven units. Metal-rich layers D and F bulge into adjacent layers with lobe-shaped margins as these dense layers sank into less dense layers. These details helped the researchers determine the stratigraphy—up in the Isheyevo sample is towards unit A, so unit A is the youngest. Relative offset of laminations along a crack in the lower left quadrant of the image and shearing along a zone in the upper right quadrant created more twists and smears of the laminations. Garvie and coauthors conclude the deformation happened before the rock compacted. This stratigraphy influenced the researchers' thoughts about the physical conditions (e.g. temperature, nebular gas densities, etc.) under which the laminations formed and how long it took. The grains themselves can give essential details about the physical conditions during formation. The researchers found the silicate grains, averaging 120 µm in diameter, are typically larger than the metal grains, averaging 66 µm in diameter. Some of the metal grains are elementally zoned. The variation in nickel to iron in the metal grains can be used to understand cooling rates in the impact-generated plume in which the grains grew. Previous research has shown that zoned Fe-Ni metal grains in CH carbonaceous chondrites could have formed and cooled in less than three weeks; see PSRD article: The Oldest Metal in the Solar System. [LEFT] Photomicrograph in reflected light of a zoned Fe-Ni metal grain in the Isheyevo meteorite that was stained with potassium metabisulfite to better reveal the elemental zoning and microstructures. The Ni-rich interior appears tan color and changes to blue as the proportion of nickel drops and iron increases. The red arrow shows the location and direction of the electron probe micro-analyzer scan line that the researchers used to determine composition. (Silicates are unstained and dark grey.) [RIGHT] Iron content (left axis) and nickel content (right axis) of the metal grain along the length of the scan line shows the Ni-rich core and Fe-rich rim. Research has also shown that deformation lines in the iron (crystal twinning called Neumann bands) not only reveal mechanical deformation, but if they are curved, also indicate low-temperature plastic deformation (meaning a permanent change in shape without fracturing). Some Isheyevo metal grains contain curved deformation bands. Planetary accretion was violent with energetic collisions between bodies, again and again, in the early Solar System — gas, dust, collisions, impact debris, accretion, repeat. Artist's snapshots of a collision sequence, left to right, between two rocky bodies producing a plume of impact debris. With this in mind, the fine laminations in the Isheyevo meteorite are even more remarkable. How did they form and why weren't they destroyed in subsequent collisions on the body, including the collision that liberated pieces that eventually landed one 16-kilogram stone near the village of Isheyevo, Russia? The team of Garvie, Knauth, and Morris suggest the following formation events and processes to explain what we see in Isheyevo. It would have all begun with a glancing collision between two planetesimals that sent a plume of ejecta debris into the surrounding nebular gas. That debris was aerodynamically sorted into different sizes. Before turbulence could remix the debris, the surviving planetesimal continued to spin downrange, actually passing through the plume. Imagine a planetesimal spinning through a dust storm and being coated with layers of particles, a meter or more thick depending on its velocity and rotation rate and the plume's velocity and gas density. The authors propose that the ejecta plume was slowed by gas drag and that the planetesimal spun through at speeds that allowed gentle settling of material into layers in a process dubbed sweep-up. Hence, they do not interpret the sequence of layers seen in Isheyevo as a continuous and uninterrupted accretion sequence. Rather, Isheyevo is material accumulated while that part of its parent body—the spinning planetesimal—moved into the debris plume. As Morris and colleagues further explain, "In order to meet the constraints on cooling times for metal spheres, sweep-up must occur within days to weeks [after the collision]. According to our parameter studies, gas densities in the range of ρg = 10-11–10-12 grams per cubic centimeter are indicated for accreting bodies moving with a sweep-up velocity of vsu = 25–500 meters per second." Computer simulations have modeled the dynamics, temperatures, and cooling rates in ejecta plumes in nebular gas. The models predict a range of variable cooling rates that compare favorably with data from meteorites. Part of one simulation is shown below by Mark Richardson (University of Oxford) and colleagues from SUNY Cortland. Computer simulation of an expanding ejecta plume showing temperatures of particles. This is a view looking down on a test plume against a backdrop of ambient nebular gas. Most heating occurs along the leading front of the plume (yellow). The researchers also found that cooling is most efficient near the top and bottom of the plume. Source: Richardson, M. L. A., Ouellette, N., Metcalf, M., and Morris, M. (2017) Cooling Rate Distributions in Ejecta Plumes, Lunar and Planetary Science Conference XLVIII, abstract 2737. After the swept-up particles landed, shaking during subsequent impacts probably caused additional separation of metal and silicates. The continued barrage of impacts would have also likely buried the materials where deformation and compaction finally preserved the microstructures and unique sequence of layers seen in the Isheyevo meteorite. PSRDpresents: Accretional Layers Preserved in a Meteorite --Short Slide Summary (with accompanying notes). Taylor, G. J. (September, 2000) The Oldest Metal in the Solar System, Planetary Science Research Discoveries, http://www.psrd.hawaii.edu/Sept00/primitiveFeNi.html.